It’s down to business now for Miss Cook Islands, with the judged sections of the Cultural Pageant to be held throughout the next two weeks. Following the successful launch of Miss Cook Islands Pageant Association events on Rarotonga and Aitutaki last week, preparations are well underway in the lead up to the final pageant event. Contestants and their support teams have been spending every spare minute of time with late night practices and rehearsals. 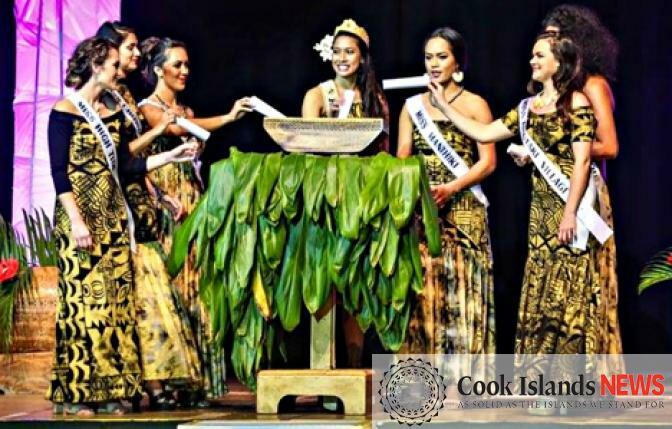 The six contestants from all corners of the Cook Islands will be vying for the ultimate title of Miss Cook Islands/Maine Kuki Airani 2015, and then Miss Pacific Islands Cook Islands 2015. The ladies will also be vying for the titles Maine Tapairu 2015, Maine Purotu 2015 and four are hoping to become the first ever Miss Aitutaki. MCIPA has announced the calendar of events for the judging sections of this year’s pageant. The first is the pre-pageant presentation and interview to be held this Saturday at the Muri Beach Club Hotel at 1pm. Next Thursday, the National Auditorium will host the opening night and talent section, starting at 7.30pm. Following the opening night, the National Auditorium will again host the highly-anticipated crowning night which will include island beachwear, evening gown and stage interview sections. All events will have a cover charge of $10 and MCIPA say they are happy the low prices will ensure as many people from the community as possible can enjoy the pageant. For the pre-pageant interview on Saturday, the public is reminded that Muri Beach Club Hotel is an adult’s only venue. At the official launch last week, the contestants confirmed their order of appearance and topics for presentation at the interview event this Saturday. Contestant number one, Miss Ora Fiduciary Mamia Opuu, representing Manihiki, will answer a question related to health. Contestant two, Miss Prime Foods Casey Viti, representing Atiu, will answer a question related to education. Contestant three, Miss Vaka Cruise Tepaeru Toka, representing Aitutaki, will answer a question related to tourism. Her question is: “How can the Cook Islands be better promoted on social media?”. Contestant four, Miss Veera Deane Angel Williams, representing Aitutaki, will answer a question related to women in leadership. Contestant six, Miss Crown Beach Resort and Spa Felicia George, representing Aitutaki, will talk about culture. Last, but certainly not least, contestant seven, Miss High Tide Bar and Grill Adoniah Lewis, representing Rarotonga and Mangaia, will be asked to speak about technology in the islands. The Miss Pacific Islands Pageant 2015 has also been confirmed by the Miss Pacific Islands Board with MCIPA. The pageant is set to take place from December 5 to December 12 here in the Cook Islands. MCIPA is confirming the theme and full programme with all the members of the Miss Pacific Islands Board. Following the Miss Cook Islands Pageant, MCIPA will be calling on the community to prepare to host the teams from the various countries in the region. MCIPA committee member, Metua Vaiimene says the Miss Pacific Islands pageant will be a highlight of the 50th anniversary celebrations. For further information on pageant events, people can contact the members of MCIPA or visit their facebook page, facebook.com/misscookislandspageantassociation.